Due to the popular demand of Android development tools, The Disgruntled Rats have decided to release source code to an Android build environment that is highly customizable. This is one of the ways that the Disgruntled Rats are giving back to the community. If you are having trouble getting Android and Ant to play well together, we recommend downloading the latest version of our android-build environment. It will have everything you need to get started with Android and Ant development. You can even hook it into Hudson! 1) Extract the contents of the ZIP file. be set to the path of the Android SDK you downloaded. 5) Install the sample package on the emulator. 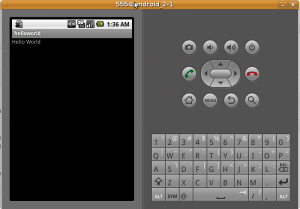 6) Run the “helloworld” program on the emulator.